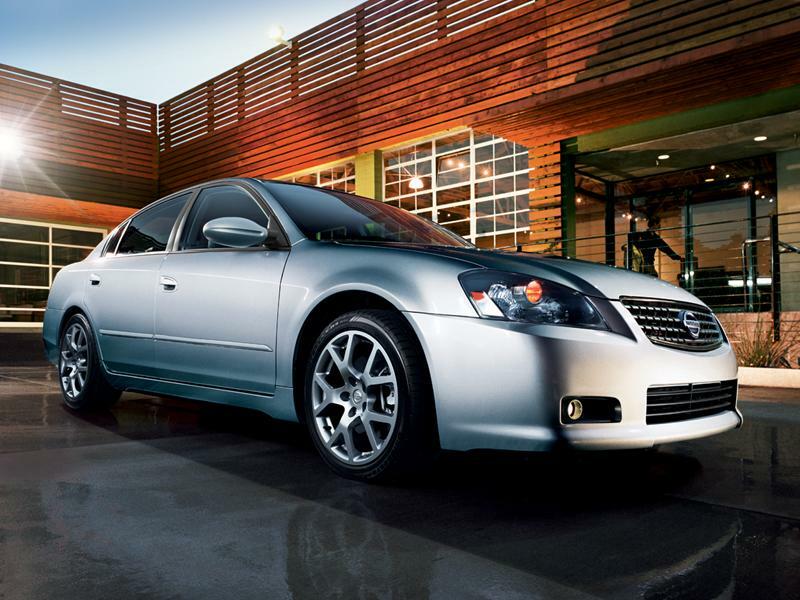 San Francisco: Since 2002, the Nissan Altima has offered buyers something different in the midsize field. The original Altima was more of an oversized compact when it debuted in the early 1990’s, but the new model goes toe-to-toe with the extremely popular Japanese-name brands (you know who they are). The 2005 model is an evolution of the revolutionary 2002 edition. The front and back ends have been tidied up, with new combination headlamps and large round chrome-festooned taillights, a revised hood shape, and some chrome accents for upper level cars. Newly designed wheels are an inexpensive but noticeable upgrade. Even the base model now wears 16-inchers. It is inside the car where the real upgrade becomes obvious. Nissan designers massaged the dash to a new design that feels extraordinarily spacious. Addressing complaints, the materials have been upgraded, although the doors on the console bins still feel a little flimsy. Chrome accents go a long way toward imparting substance in the new Altima, with the satisfying feel of the metal door levers a real tactile improvement. The chrome rings on the instrument panel liven up the dash considerably. The fake wood in my test car was unconvincing, but still looked attractive. The trip computer in my Sonoma Sunset colored test unit worked much like others I have used, but the button was a little ¼-inch tab on the steering wheel spoke. Once I got used to pushing it, I found it easy to manipulate the control while driving. The cupholders are gargantuan, and the liners come out for dishwasher-safe cleansing. My car’s beige cloth seats were quite comfortable, and the fabric matched a wide sweep across the doors. The fat three-spoke leather steering wheel felt good to grip. The poetically named interior choices are Charcoal, Blonde and Frost. The Altima continues to have plenty of oomph under the hood if you want it. The economical choice is a four-cylinder 2.5-liter four that puts out a respectable 175 horsepower and 180 lb.-ft. of torque. This thrifty and clean powerplant meets the PZEV (partial zero emission vehicle) standards in California. The upgraded powerplant is a 3.5-liter V6, which puts out 250 horsepower and 249 lb.-ft. of torque. My tester contained this engine, and it hauled the car along swiftly. I got the five-speed automatic with gated shifter in my car, but a five-speed manual is also available. It’s not easy to find a car these days in the midsize segment that let’s you row your own gears unless you move up to the German luxury sedans. Package. Next comes the 3.5 SE, with which I spent my week in, and there is a new 3.5 SL model. Most interesting for enthusiasts is the top level 3.5 SE-R variant, which manages to eke an extra 10 horsepower out of the V6 engine, and enjoys a performance exhaust system, more aggressive exhaust pipes, and rakish 18-inch alloy wheels. My 3.5 SE was rated at 20 City, 30 Highway, but I achieved an average of 20.2 miles per gallon with a week of mixed driving conditions. My 3.5 SE came stocked with all of the features you expect on a midsize car, including power windows, which had power up and down for the driver. You can open or close the driver and passenger windows by turning the key in the ignition or using the keyless remote. The driver’s seat has eight-way power adjustment. The volume on the AM/FM/CD player has speed sensitive automatic volume control. The headlamps have an automatic setting that turns them on at night. The mirrors and locks are power, and air conditioning and cruise control are on the standard menu, too. That’s quite a complete package. The base SE model, with four-cylinder engine and automatic transmission, starts at just under $18,000, the SE-R tops out just under the $30,000 mark.